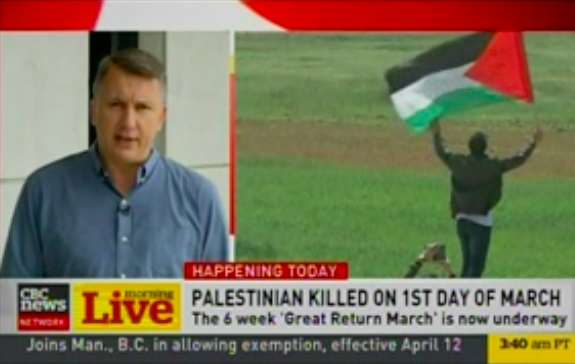 Today at 6:39am, CBC TV produced reporting on the mass protests along the Gaza border with Israel, where tens of thousands of Palestinians have gathered and many who have violently rioted at Hamas’ behest. As of this writing (11:00am EST), 12 Palestinians have been killed with over 1,000 injured. In light of this information, HonestReporting Canada asked that CBC News take immediate corrective action to set the record straight. Stoffel also reported throughout the day on radio/tv about the Palestinian “right of return” without mentioning that it is a demographic ticking bomb that would see the Jewish state replaced thanks to the influx of millions of Palestinian refugees. Stay tuned to this page for further updates. HonestReporting Canada is vigilantly monitoring and engaging with the Canadian media to ensure that these matters are reported accurately, fairly and with balance.